We’re exciting people. There is little-to-no doubt about that. And our weekend proved it. Sunday, particularly, which was comprised of eight episodes of Downton Abbey. Just call our homestead Downton Arey from now on (but please, seriously do that, because I’m really trying to make that stick), fawning over Maggie Smith and lots and lots of Yahtzee. Yes. Yahtzee. The family friendly dice game that taught you how to strategize and master simple addition (which was clearly an exercise I hadn’t engaged in lately, because… whoa). The one that we were so hungry for, we downloaded and printed off score cards and played at least 27 rounds of. And we didn’t even make it a drinking game. Not any of it. We were just on a roll (insert sitcom laugh track here). We tried to stop, but no dice (again, laugh track rolls. I’m such a natural Danny Tanner…). So then we ate pizza. Downton Arey gettin’ craaaazy. In a food processor, combine red curry paste, garlic and coconut milk. Puree until garlic is minced and well combined (mixture will be thin). Add chickpeas and olive oil. Pulse until mostly smooth. Add spices and mix until combined. 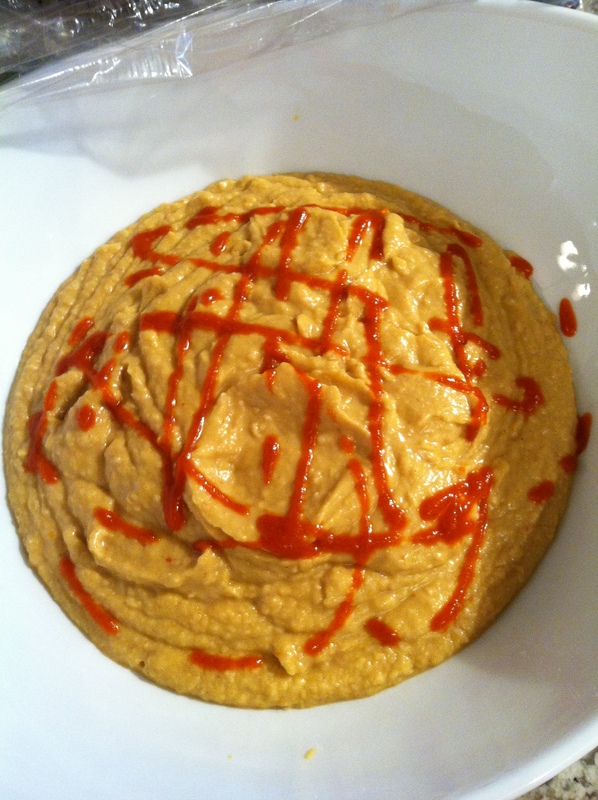 If hummus is too thick, add coconut milk by the tablespoon until desired consistency. Likewise, if hummus is too thin, add more chickpeas. Garnish with drizzle of sriracha and refrigerate.